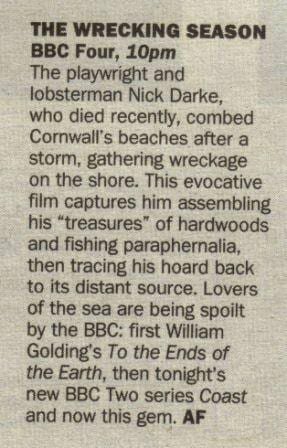 After Nick’s death from cancer Jane made another documentary film about their life together and her grief, THE ART OF CATCHING LOBSTERS. First broadcast in 2007 on BBC4. The north coast of Cornwall is one of the best collection points in the world for long-haul drift. When a southwest gale blows for three days, artifacts and natural objects from across the world – from Labrador down to the Amazon Basin – wash up on these shores. Playwright Nick Darke came from generations of beachcombers, or wreckers. In the film, he traces everything he finds along the coastline back to its source, via the telephone and the internet. Over many years, he built up a unique picture of coastal communities around the Atlantic, making friends with fishermen, scientists, oceanographers and fellow beachcombers along the way. 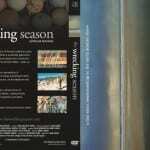 This film follows Nick onto the beach during one stormy winter and records all his discoveries. His wife Jane filmed and directed the film. Nick was a celebrated playwright whose work is performed internationally, he died in June 2005. 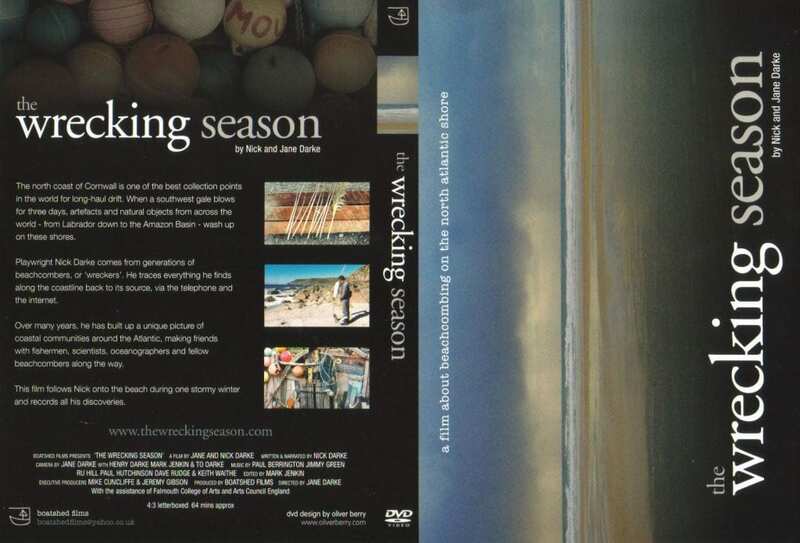 The Wrecking Season was first shown on BBC4. 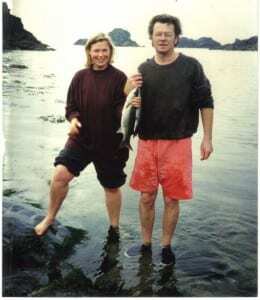 Nick Darke was raised on a beach in Cornwall. In the winter he would go out wrecking with his father and in the summer they would fish for mackerel and lobsters. They also had a share in a beach seine net with other local families. His father, grandfather and great grandfather had all gone to work on ships in the merchant navy so he grew up with an understanding of the sea and wind and how they worked together. Despite this he was still amazed and delighted when he discovered that it brought strange messages and wild debris from the Americas. 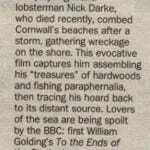 In 1999 he made a programme for BBC radio 4 ‘Atlantic Drifting’ which was the starting point for The Wrecking Season. In 2001 he was given funding by The Arts Council, England, to make a film and a book. His wife Jane started filming him and ended up directing the documentary. She was awarded ‘The Best First Time Director Award’ at The Celtic Film Festival in 2005. Jane and Nick always went wrecking together, he concentrated on lobster tags and wood and large seeds from South America. Jane went for small seeds, lighters with writing on and natural objects. 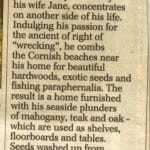 Jane is continuing to wreck the beaches of North Cornwall, often with her sons. Nick was a strong champion of Cornish culture and communities. What he discovered through wrecking was that the coastal Cornish are part of a larger community that fringes The Atlantic Ocean. They have the same concerns and similar traditions. They turn their backs to the land and look out to sea.